. Tags: eee pc, hp, Linux, mini-mate, mini-pc, SuSe. After the runaway success of the Asus eee pc, HP launched their first sub-portable, the HP 2133 mini-note yesterday. At first glance, the mini-note looks to be both stylish & functional, and priced competitively. 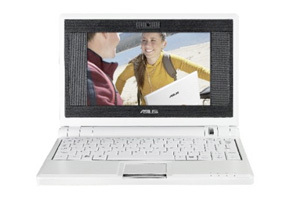 In comparison with the Asus eee pc, the mini-note has a larger, higher definition screen (8.9-inch diagonal, 1280 x 768 WXGA vs eee’s 7 inch 800 x 480 resolution), a larger keyboard (stated as 92% the size of a full-sized keyboard) and comes with a choice of either a solid-state flash (4 GB) or traditional SATA hard drive (120GB 5400 or 7200 RPM). HP is also offering a choice of operating system installations ranging from Windows Vista Business (with a windows XP Professional downgrade available) to SuSe Enterprise Desktop 10. HP’s mini-note is scheduled for shipping next week, although early versions of HP’s web site appeared unsure of their own products specification and dimensions, stating that the mini-note has a 6.9 inch diagonal screen in one specification, and the (correct) 8.9 inch screen in the adobe pdf. PC World has a detailed review of a mini-note, running the Windows Vista Business operating system and priced at $749. I’m looking forward to a detailed review of the eee Linux competitor, priced at a very affordable $499 running SuSE Linux, a VIA C7-M 1-GHz processor, with 512MB of RAM— and their $599 configuration which will come with a 1.2-GHz processor, 1GB of RAM, and a Windows operating system (either Vista Basic or XP).